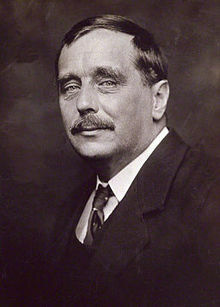 Herbert George Wells (21 September 1866 – 13 August 1946), kent primarily as H. G. Wells, wis a prolific Inglis writer in mony genres, includin the novelle, history, politics, an social commentar, an textbeuks an rules for war gemmes. ↑ "Lost daughter of Wells' passion. (writer H.G. Wells) - Version details - Trove". Trove.nla.gov.au. 1996-08-11. Retrieved 2014-03-25. ↑ "Death Notice Summaries Available for Listings at A Memory Tree". Amemorytree.co.nz. Retrieved 2014-03-25. ↑ "Wells, H. G.". Revised 20 May 2015. The Encyclopedia of Science Fiction (sf-encyclopedia.com). Retrieved 2015-08-22. Entry by 'JC/BS', John Clute and Brian Stableford.